Not the wet cold kind, but more the thread and needle type. I've mentioned before that my mom and I are both working on making the quilt Winter Wonderland by Crabapple Hill. (You'll have to click on the link to see a picture of the whole quilt.) She's doing hers in blues and creams and I'm using neutral colored flannels and black floss for mine. Our first step is to embroider the ten blocks that make up the center. When I visited her last weekend, she was working on her very last one which also happens to be the biggest. She only had a tiny bit left (which she's since finished) of one of the trees and a few snowflakes. Didn't she do a great job with her embroidery stitches? She used a deep blue DMC perle cotton for hers on Bone colored Kona cotton. See all those circles? As another example of getting the hard part over with, I'm stitching all the snowflakes (and their circles) first. I believe there are 22 of the devils in this one block. However, since I took this picture, I've managed to finish all of them and have moved on to one of the trees. Those are much easier and more enjoyable to stitch. 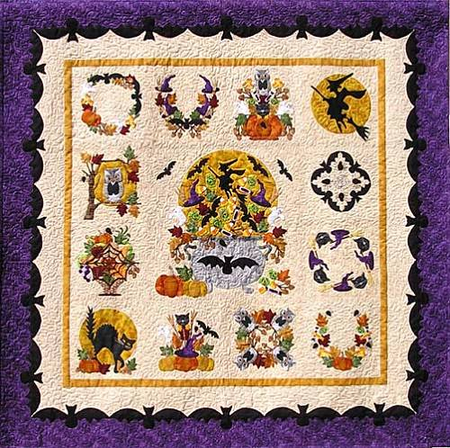 Pearl P. Pereira designed this Baltimore Halloween quilt and I have to say that her patterns are a pleasure to work with. 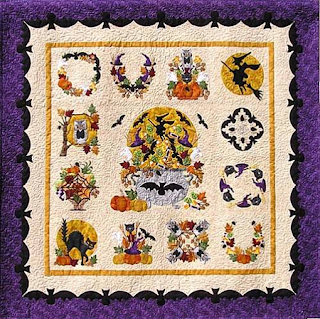 There are several others I'd like to do and in fact, I'm getting her Baltimore Christmas one as a block of the month right now from Shabby Fabrics. always love seeing Winter Wonderland!!! What a beautiful project!! :) A labor of love - but so worth it!